Mehndi dresses are an indispensable part of your mehndi ceremony. Mehndi outfits for bride along with accessories like floral jewellery and gota jewellery can bring together the entire mehndi look. If you too are looking for trending mehndi dresses, then have a look at these 25 mehndi outfits that real brides rocked on their day of mehndi. This mehndi dress in lime green with chrome applique is a bright and peppy choice to wear on your mehndi for summery and fresh vibes. Do you have an offbeat style like this bride? Well, this mehndi outfit of dhoti, choli and a flowy jacket is something that’s edgy, modern and perfect for a daytime mehndi event. If a mad mix of bright colours is what you love, then this mehndi outfit of multicolour lehenga choli is something you will totally love! This lovely mehndi outfit of asymmetrical lehenga and cape sleeve choli is perfect if you are a bride who prefers minimalism and likes to keep it chic and stylish! Isn’t this bride’s purple mehndi dress giving you major #mehndiweargoals? Here’s yet another dhoti choli combo that you can take inspiration for your mehndi outfit. It is simple, chic and perfectly befitting a modern bride’s style! A multicolour floral choli paired with a solid silk skirt is as classic as a mehndi outfit gets! Put on some mehndi jewellery and you are set to rock your mehndi look like a total boss bride! Nothing beats a mehndi dress like a fresh and vibrant seafoam green lehenga, does it? Bonus points if it has really long cape sleeves! If your personal style is edgy and you like to experiment with your outfits, then a mehndi dress like this is sure to catch your fancy! Don’t forget to accessorize right and you’ll be all set for your mehndi function! You can check out more offbeat mehndi dresses for bride here. A beautiful embroidered net lehenga makes for a fresh and fabulous mehndi outfit for a daytime celebration. Amp up the look by using the right kind of jewellery, makeup and hairstyle! A bright yellow colour, gorgeous floral embroidery & and one-shoulder ruffle sleeve! What’s not to love in this mehndi outfit for brides? A simple peach lehenga with floral embroidery, when paired with a ruffle sleeve blouse, makes for an elegant mehndi dress for the bride. This lovely lehenga is an elegant and minimalistic mehndi dress choice for a bride who wants to keep it simple. Ombre is the latest trend of 2018 for all things fashion. This lovely ombre orange lehenga with mirror work embellishment and a floral choli is a great mehndi outfit pick for brides! This stunning mehndi outfit of a multicolour lehenga with mirror work has taken my breath away! It is not too bold and jazzy but has the perfect hint of glitz and glam required for a mehndi ceremony. Fashion is to have fun with, right? Pair a simple white shirt with a Banarasi lehenga and use minimal accessories to make a mehndi outfit that no one can take their eyes off! Is there a more stunning mehndi outfit you have seen off-lately? The riot of violet on this lehenga is a delight to look at! An off-shoulder blouse paired with a beautifully embroidered lehenga is a good choice as a mehndi outfit for brides who like bright colours that bring out their vibrant and peppy personality. Simple, understated yet glamorous. This lehenga is everything that a mehndi dress for brides should be! A lovely sky blue lehenga paired with a peach dupatta looks nothing less than a dream mehndi outfit for brides who love pastel colours and a little bit of bling! This baby pink lehenga with rose gold embroidery is perfect as a mehndi dress for a bride who wants to wear pink, but not overdo it. Shweta Tripathi looked oh so cute in this mehndi outfit of hers! Doesn’t Yuvika Choudhary look like an ethereal dream in her mehndi outfit? Love how she chose a knee-length lehenga instead of a floor-length one for ease of applying henna. Smart & stylish! This beautiful mehndi outfit designed by Shubhika of Papa Don’t Preach is ideal for brides who wear something traditional but with a contemporary twist! Yellow if the perfect sunshine colour to use in your mehndi outfit. Doesn’t this bride look absolutely radiant in her yellow mehndi dress paired with floral jewellery? If you are not a lehenga girl and want something fun and comfortable to sit through the long hours of mehndi application, then a flowy mehndi dress like this one is just the right pick for you! 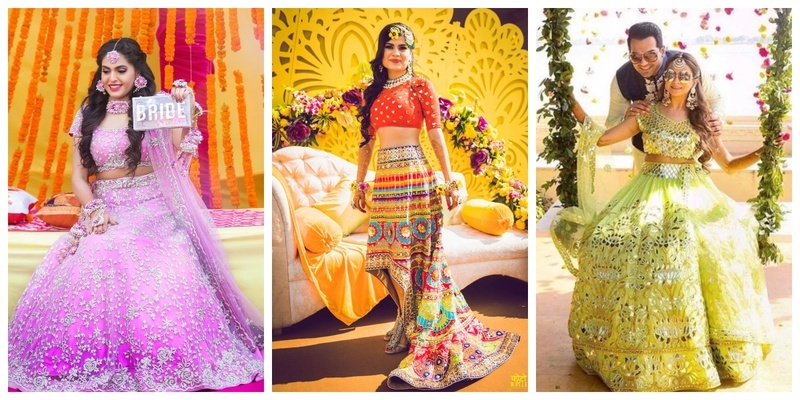 Did any of these mehndi dresses catch your fancy or give you major #mehndiwear inspiration for your mehendi ceremony?